This is a tale of unorthodox relationships, shifting alliances, and contentious allegations. An intricate, compelling, intelligent psychological suspense that stands out in the crowded field of domestic mysteries being published today. Two sisters, abandoned by their father to live in hardship with their mother are inexorably bound in a love/hate relationship by guilt and a terrible secret. There is Hattie, a red headed beauty whose laughter tinkles like fine crystal. Heads turn when she walks by or enters a room. Everyone wants to know her. Then there is the older sister, Penny. The complainer. The scold. The Debbie Downer. The killjoy who harbors a jealousy of Hattie so unrelenting it infiltrates her dreams at night. It's a begrudging ill will that continues in varying degrees throughout the book. When they were little, Penny taunted and tormented Hattie relentlessly saying she was the reason their father left, sending Hattie on a guilt trip from which she never returned. After their mother dies, Penny becomes Hattie's guardian. Standoffish and with a mean streak, Penny continues to sneer at and goad young Hattie while they reside in the family home in a Grey Gardens-like living arrangement. And yet, underlying all the grudge and scorn is love and loyalty. Either sister will do anything for the other, which is where the problems come in. The story begins after a crime has been committed, a crime in which both sisters participated, though exactly how and to what extent is not yet revealed. This aftermath is described in a prologue that, strangely, is not called a prologue. Part one begins a year later. This is how Penny remembers it then: "After it was done, we cuddled like in a storm under an old quilt. Both of us shivering. Hattie put her arm around me, and I winced at her kindness." Author Laurie Petro forsakes a strictly chronological telling. As the story continues, events go back and forth in time jumping from present to past to near past then to present again in the form of flashbacks or internal dialogue. Even so, the transitions are smooth enough that readers will not get lost. When Hattie meets a lovely, sensitive young man and brings him home to meet Penny, they all hit it off right away and form a sort of family. There's Hattie and Jameson in one bedroom, and Penny in another. Penny describes their relationship like this: "In the ways that young people are so good at, Hattie and Jameson and I slept late, started the ritual of summertime partying early, drinking and singing and twirling our hair in our fingers; we made exotic food and still settled for potato chips, told awful jokes, bumped into each other in the middle of the night, and did the whole thing again the next day." In the midst of all that, Hattie asks Penny for a favor. Penny complies, but not in the way Hattie had expected or wanted. The result was the same though, so no questions were asked. At first. Here's Penny again: "An image of Jameson's arm wrapped around my waist emerged in my mind, and I burned further with embarrassment, banishing the thought. I loved Hattie, I did. But my life had never been my own. Everything I have ever loved has been sucked into her vortex. . . It's not enough to have my life. She wanted my body as well. And Jameson. I couldn't stop my mind from creeping in his direction . 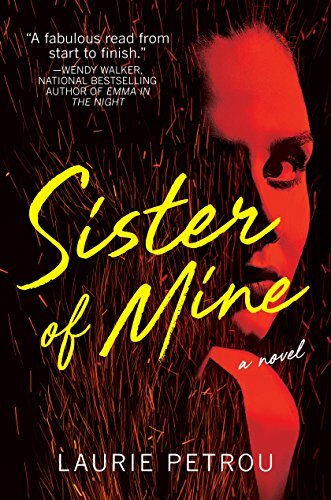 . . "
Some readers may not like either of these sisters, or some of the other characters, for that matter, but the story is gripping, twisty, and singular. A not to be missed, well-worth-it read. Here's hoping for more from this imaginative, insightful author.